A lot of conversion builders want to use J1772 charging but also want to be able to use a NEMA 5-15 plug and extension cord for charging at unexpected locations. Many people just wire the connectors in parallel. This leaves the exposed blades or prongs of the NEMA 5-15 3 wire household connector exposed and energized when using the J1772. Then when this is charging with the 120 VAC via the NEMA plug the pins in the J1772 are energized but they do have some protection. Many people say "I know what I am doing and it is safe enough" but as people look at the car or someone else uses it "safe enough" is not enough. 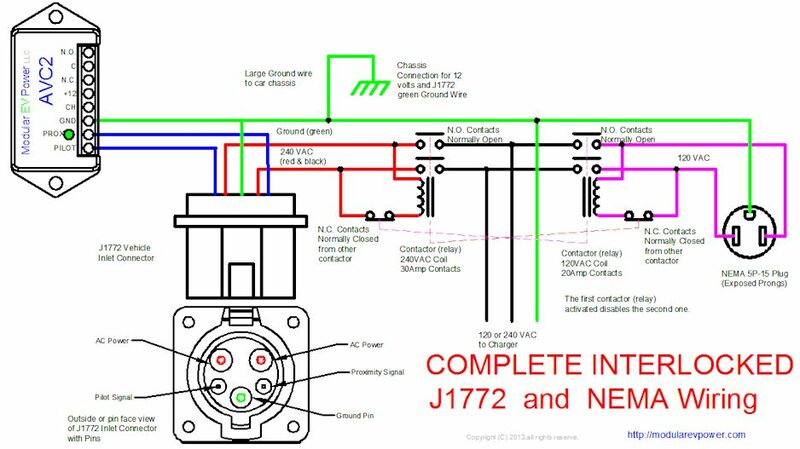 The Complete Interlocked version uses a normally closed contact on each contactor to disable the other contactor.